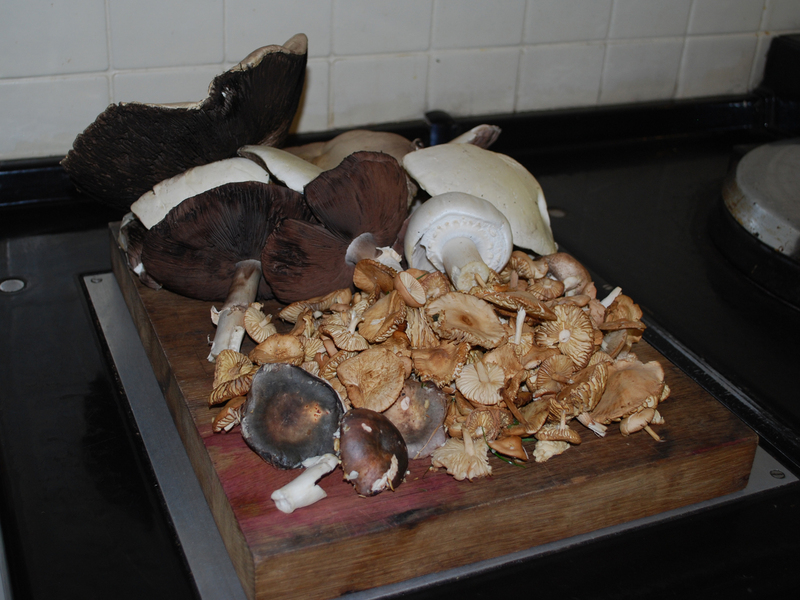 A good way to use a mixture of foraged mushrooms and very filling for satisfying disgruntled meat eaters. Melt the butter and remove from the heat, mix in the flour and seasoning to make a rue then add the milk gradually while stirring. Add half the cheddar and bring to the boil stirring all the time to prevent lumps forming. Put to one side. Fry the onion, carrot and celery for a few minutes, add the mushrooms and garlic, season and fry until softened. Add the wine and water and cook until the vegetables are soft adding more water as needed. Thicken with cornflour, if necessary. Put a layer of the mushroom mixture in an oven proof dish, cover with lasagne sheets and pour on some of the cheese sauce. Repeat until you run out of ingredients ending with a layer of cheese sauce. Grate the rest of the cheese and sprinkle on top with the parmesan. Cook in a fairly hot oven for about twenty to thirty minutes or until the top is nicely browned.